There are some sounds made in music that are just beautiful because of their simplicity and because of an other worldly ambiance; the sound of a Scandinavian female singer being a great example. The tone of the voice and the sharpness of a finished line at the top of the singers octave range lend an ethereal quality that cannot fail but to make a heart and soul soar. And when combined in a clear, crisp harmony the effect is magnified so wonderfully. And in the new album by Swedish sisters Klara and Johanna Söderberg as First Aid Kit, the harmonies in their country tinged Scandifolkpop, are outstanding. 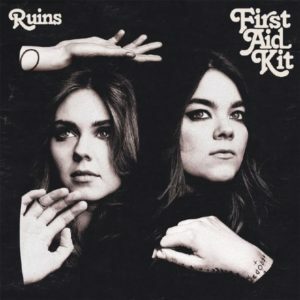 The album, Ruins, led by the gorgeous single Fireworks, truly does light up the sky, but with gentle and subtle tones. Like a David Gilmour guitar solo or a Nick Drake lyric, the beauty of this album lies in its simplicity. Expertly produced by Tucker Martine at his Flora Studios in Portland, Oregan, the album leaves wide open spaces filled with great playing by the likes of Peter Buck of R.E.M and McKenzie Smith of Midlake. The production and accompaniment truly enhances the harmonies Klara and Johanna layering quality upon quality resulting in a very fine album indeed. The sisters seem so confident in what they have produced; with that confidence giving them, and their producer, the ability to know what not to add. This is a very fine record that deserves the wide audience it will surely get.